With a current population inflow into cities of 200,000 people per day, UN Habitat expects that up to 75% of the global population will live in cities by 2050. Influenced by forces of globalization and global change, cities and urban life are transforming rapidly, impacting human welfare, economic development and urban-regional landscapes. This poses new challenges to urban governance, while emerging city networks, advancing geo-technologies and increasing production of continuous data streams require governance actors to re-think and re-work conventional work processes and practices. This book has been written to enhance our understanding of how governance can contribute to the development of just and resilient cities in a context of rapid urban transformations. 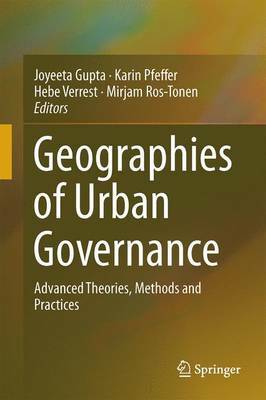 It examines current governance patterns from a geographical and inclusive development perspective, emphasizing the importance of place, space, scale and human-environment interactions, and paying attention to contemporary processes of participation, networking, and spatialized digitization. The challenge we are facing is to turn future cities into inclusive cities that are diverse but just and within their ecological limits. We believe that the state-of-the-art overview of topical discussions on governance theories, instruments, methods and practices presented in this book provides a basis for understanding and analyzing these challenges.